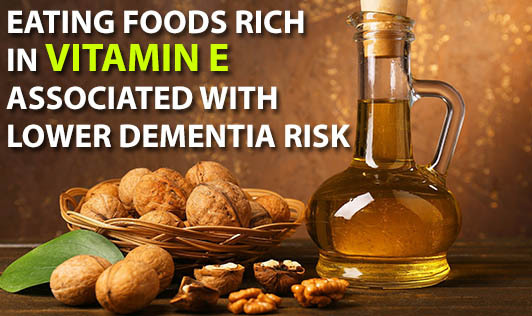 Consuming more vitamin E through the diet appears to be associated with a lower risk of dementia and Alzheimer's disease, according to a report in the July issue of Archives of Neurology, one of the JAMA/Archives journals. Oxidative stress -- damage to the cells from oxygen exposure -- is thought to play a role in the development of Alzheimer's disease, according to background information in the article. Experimental data suggest that antioxidants, nutrients that help repair this damage, may protect against the degeneration of nervous system cells. - Mustard Greens – These hot tasting greens are among the top carriers of vitamin E and contribute a lot to a healthy meal. Although many like them best cooked, consider lighter cooking or use in salads in order to retain the most benefit. - Swiss Chard – This is another leafy green that helps put a whole lot of vitamin E onto your plate. - Spinach – Spinach is an all-around health booster. With vitamin E and many more antioxidants and essential nutrients, spinach is also among the easiest foods to use. Make it a part of salads, sandwiches, pasta dishes and much more. - Kale and Collard Greens – These greens also have their share of vitamin E and other essentials. - Nuts – Almonds and some other nut varieties contain vitamin E and more great nutrients. Nuts are a good way to eat healthy on the run because they are so easy to take anywhere and routinely eaten in their original raw state. - Tropical Fruits – Fruits like papaya and kiwi are sources of vitamin E. Think about getting these exotic foods that are increasingly easy to find at your local supermarket. - Red Bell Peppers – These colorful peppers are a great source of vitamin E, vitamin C, and other similar powerful antioxidants. Again, think about how to use these vegetables fresh for a greater health value. - Broccoli – This green vegetable is another frequent addition to the dinner plate that brings a lot of healthy substances to a meal. Although fresh is best, some experts also recommend including this veggie steamed. - Oils – Vegetable oils such as olive oil are also a good source of vitamin E and other nutrients. Experts recommend keeping oils away from sunlight to help keep them fresher. - Wheat – This plant can also be a great source of vitamin E, although nutritionists point out that processed wheat is often lacking in this essential vitamin, simply because the germ, which is often removed, contains the main portion of the nutrient. Over an average of 9.6 years of follow-up, 465 participants developed dementia; 365 of those were diagnosed with Alzheimer's disease. After adjusting for other potentially related factors, the one-third of individuals who consumed the most vitamin E (a median or midpoint of 18.5 milligrams per day) were 25 percent less likely to develop dementia than the one-third of participants who consumed the least (a median of 9 milligrams per day). Dietary intake levels of vitamin C, beta carotene and flavonoids were not associated with dementia risk. Results were similar when only the participants diagnosed with Alzheimer's disease were assessed.